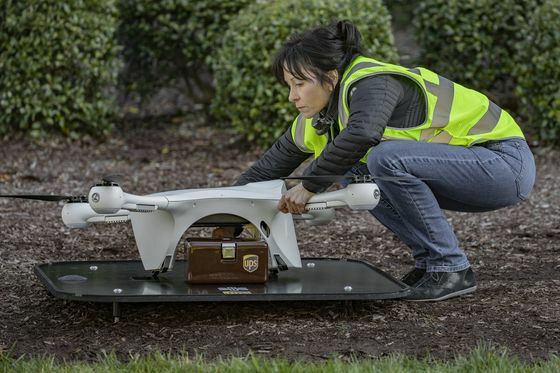 UPS Begins First Regular Commercial Drone Deliveries in U.S.
(Bloomberg) -- United Parcel Service Inc. and a startup drone partner began the first continuing commercial drone deliveries in the U.S., making a short flight carrying a medical sample between North Carolina hospitals on Tuesday. The deliveries, using a drone made by Matternet, take less time than the vehicles used by the WakeMed Health & Hospitals network in Raleigh. UPS plans to make multiple flights daily for the hospital system, augmenting the ground service that is performed by another company. UPS expects to use the experience gained with WakeMed to offer similar services to other U.S. hospitals. The drone deliveries further UPS Chief Executive Officer David Abney’s push into managing and delivering health-care products. The business has helped offset the squeeze on profit as online retailing boosts residential deliveries, which have tighter margins than shipments to businesses. UPS also has worked with Zipline, a drone maker and operator that is delivering medical supplies to remote areas in Rwanda. Menlo Park, California-based Matternet, which raised funds from Boeing Co. last year, is operating the drone at WakeMed as part of the Federal Aviation Administration’s Integration Pilot Program. The small unmanned quadcopter, which carries a five-pound payload and travels about 12 miles, is flown by a remote pilot. UPS handles logistics and customer management for the deliveries. Matternet has completed more than 3,000 trips for health-care systems in Switzerland.